Anyone who knows me even a little knows that my days as a die-hard 48 group fan have more or less ended. I think that they have a lot to offer as far as awesome idols and TV variety shows go, but musically, that phase has kinda passed for me due to what I perceive as a massive dip in quality the last few years. That being said, they do deliver some cool tunes from time to time. HKT48’s latest offering is pretty…well, passable. Right away we see that this PV is shot in the great outdoors. The theme for this video is a rural concert with lots of fan interaction. Everything feels very personal, as there are tents and campers everywhere and the extras come on stage almost at will. We even see a few on-stage proposals, hugs, and other feel-good moments between couples. The members are just as open. We see them run into the crowd free of barriers or security of any kind. The openness of this PV is a nice theme. Sadly, it all feels like a total work of fiction given the restrictions and security in place for modern day AKS events and live shows due to events we all surely remember. It’s unfortunate, and definitely not the members’ or director’s fault, but it is hard to watch this PV and not think, “yeah, this wouldn’t really happen”. 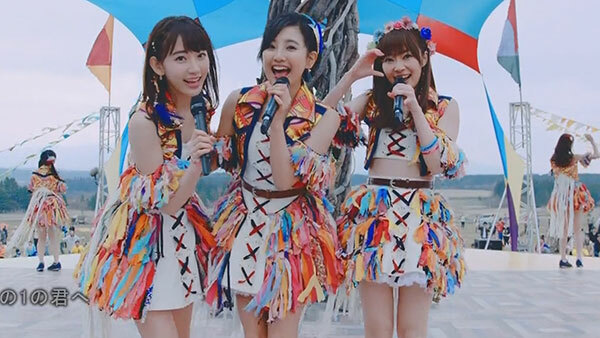 I also like the colorfulness of this PV. The outfits for the members are these really colorful dresses that almost look vaguely Native American in inspiration, with a bit of 60’s grooviness thrown in. They’re really pretty. The extras are also wearing some really colorful clothing that makes the screen pop in a pleasant way. It really gives the video some liveliness so it. None of the technical parts of this video are either that great or that bad. The dance is pretty tame, the camerawork is good but could be better, and the lack of focus on any particular member is paradoxically nice and off-putting. As nice as this PV is, it’s almost a little too chill if not downright unfocused. This may simply be a personal bias, as I’m honestly more a fan of HKT48’s more wacky side, but the presentation of what’s here is beautifully done, so I can’t complain too much. The song itself follows the same motif as the video. It’s very light and upbeat, and has a good melody to it. However, I would say it’s pretty bland as well. The instrumentals don’t really contain anything memorable and the vocals are pretty much non-stop chorus. Luckily it never falls into what I refer to as the “muddy chorus” that plagues most modern day 48 Group songs. You can still hear particular members, but you do have to pick your oshi’s voice out of a crowd. It’s good for what it is, but it doesn’t really have a lot of energy. Then again, songs like this aren’t really supposed to. In any case, HKT48 pulled this one off nicely. HKT48’s 7th single dropped April 13th.